Susannah is a brown classic torbie and white female, born 3/15/98. She came to us from Alabama as a kitten, and has completely stolen our hearts. Susannah is funny, sweet and spunky. Her nickname is "Angel Kitty/Devil Kitty" because she has sort of a split personality. Usually, she is a complete angel. She is Angel Kitty when we give her a bath, Angel Kitty with the blow drier (she *loves* the blow drier, and will lie on her back in my lap, purring and kneading the air with her front paws, while I blow-dry her tummy), and Angel Kitty in bed with us at night (she is a major cuddle-bug, and loves to tunnel under the bedclothes, where she becomes a soft purring foot-warmer. One of her other nicknames is The Bed Snake). And she is Angel Kitty with the judges (purrs and gives them head-bumps). But Devil Kitty comes out when she has to deal with other cats she doesn't know (or has suddenly forgotten). Devil Kitty screams and spits at the boys on either side of her in the judging ring (fortunately, she changes instantly to Angel Kitty when the judge pulls her out; I think she considers the judge to be her savior). Mischievous Devil Kitty steals and hides my earrings, attempts to pull my watch off my wrist, tries to bite the buttons off my clothes, and slithers under the covers to nibble my toes in the middle of the night. But whether she's Angel Kitty or Devil Kitty, Susannah is smart, quirky and utterly amusing. And (if you can't tell by now!) we are crazy about her. We are so grateful to Veronia and David Hill for letting this small furry angel (devil?) come to live with us! Susannah has large ears, extravagant lynx tips, and a lovely long, elegant head. Her muzzle and chin are square and well-defined, and her profile has a clean gentle curve. Susannah's expression, while open and sweet, has a charmingly sophisticated look, like that of a young aristocrat. Her boning and body length are excellent. Her hips are excellent (screened at 1 year of age) and her heart is sound (screened annually since the age of 1). 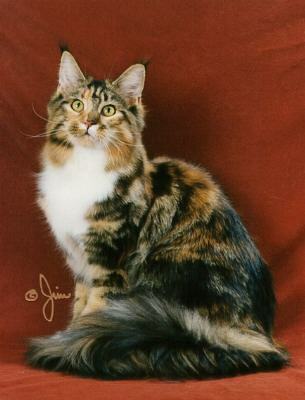 She has brilliant, deep torbie coloring, and as you can see, she's a flashy little lady! Susannah is now retired from breeding and lives happily with her new owner, Ginger, in Everett, WA. Heart Normal and healthy at 6.5 years of age. Last screened in August 2004 by Dr. Jerry Woodfield, a board-certified veterinary cardiologist.